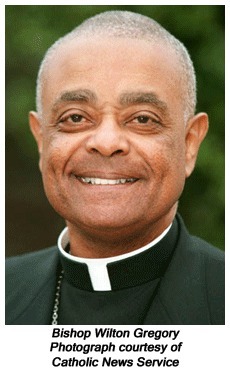 In November of 2001, Bishop Wilton D. Gregory of the Diocese of Belleville, Illinois became the first African-American elected president of the United States Conference of Catholic Bishops, receiving seventy-five percent of the vote. The vice president of the Conference described Gregory's election as "an expression of the love of the Catholic Church for people of color." Georgetown University professor of theology, Dr. Diana Hayes, characterized the Conference's overwhelming support for Bishop Gregory in the following way: "His election is saying not only do we affirm you, but you are vital to our church." I do not subscribe to those who doubt that cultural accommodation is possible between the Roman Rite and the Black American cultural heritage. I will admit that it will demand a patience on the part of Black American Catholics and the magisterium of the Church. I will admit that it is long overdue and at times can be stymied by misunderstanding, but I do not believe that it is an impossible task for either the Roman Rite nor the Black American cultural community. . . . The process of including the Black Religious heritage in the Liturgy of the Church must be directed by Black Catholics. We are the only ones who can authenticate this development. Since we alone are both Black and Catholic. We realize, of course, that we belong to a universal Church and must live within that Church, but we also realize that the gift of Blackness is uniquely ours to offer to the Church. The cultural accommodation "between the Roman Rite" and "Black American Catholics" that Bishop Gregory sought was influenced by and mirrored, to some extent, disagreements over African-American advancement strategies over the previous 100 years. African-American leaders sought to overcome the politically, socially, and economically unjust position to which their people had been relegated in American society in several distinctive ways. Booker T. Washington, William Edward Burghardt Dubois, and Marcus Garvey each had their own ideas as to how African-Americans might achieve equality in turn-of-the-century America. Elements of their philosophies of accommodation, integration, and separatism continue to influence views within the African-American community. Understanding the views of such thinkers is central to gaining a sense of the historical context in which the Federated Colored Catholics (FCC) and a central figure of this organization, Thomas Wyatt Turner, operated.